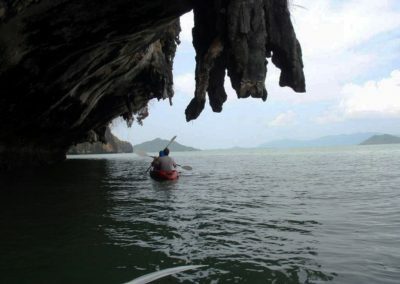 The Koh Phee & Koh Talabeng Caves and Kayaking Tour is a very nice day in the amazing nature, off the beaten track and with the right amount of action. I got picked up at my hotel on time around 8:40 hrs as scheduled and then transferred to the pier in the back of an open air pick up truck (with comfortable benches) along with the only 5 other guests booked for the day. 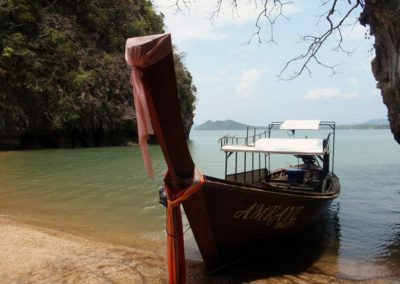 The pier is located on Koh Lanta Noi island, over the new bridge from Koh Lanta Yai, and the drive took about 30 minutes for me who was staying at the northern end of Lanta Yai while could be about 1 hour for those staying in the south. The good thing of being transferred by a pick up truck is that you get to enjoy all the views on the way, with the nice tropical countryside. The long tail boat was ready to depart as soon as we arrived at the pier, and it’s a well maintained, large and comfortable one compared to many other long tail boats I’ve been on. 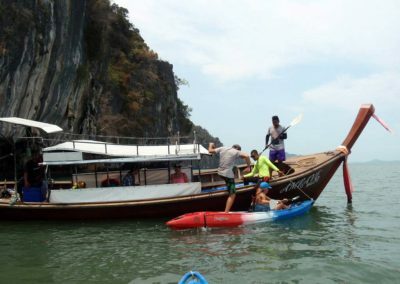 This longtail boat is also larger than average because it carries the kayaks on board. some climbing to do in order to get through the caves that dig within the island. 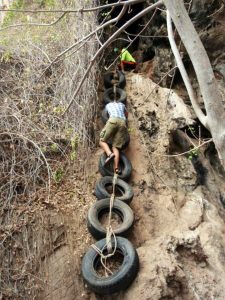 The guide is very friendly, funny and professional so he knows how to make people feel at ease and all the “climbs” have ropes and tyre ladders to make them as easy as possible. It is nothing really difficult for people who are fairly fit, while I would not recommend it for young children or people with mobility issues. 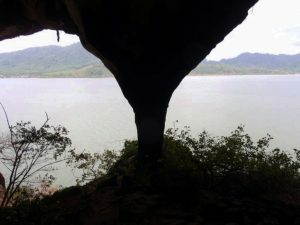 What you find inside is definitely worth the effort, since there are huge caves with very large and old stalactites and stalagmites, the are many openings so the the light gets in creating a very nice atmosphere, and lots of sleeping bats can be seen attached to the ceiling. 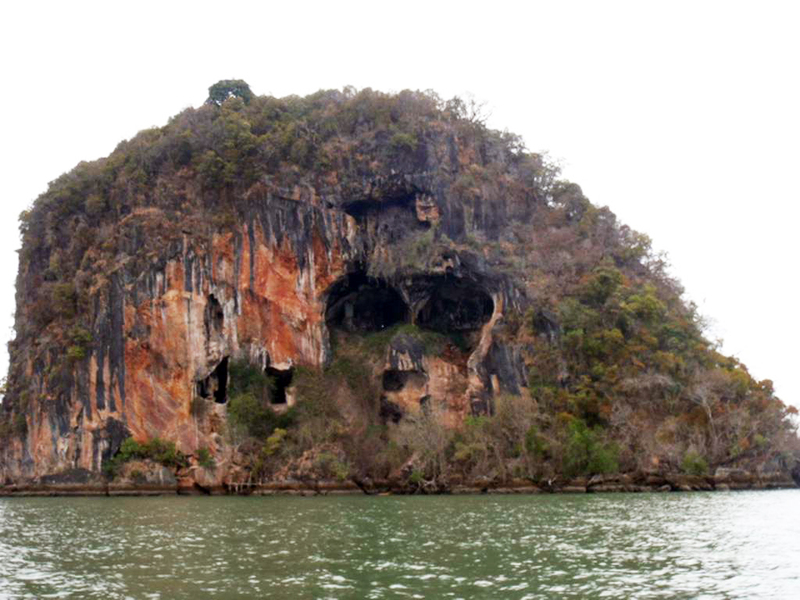 The most incredible thing is that we got to climb all the way to the inside of the “eyes” of the skull, surely a unique type of “seaview room”. The great thing was also that there were no other boats or people there, we had the whole island for ourselves making it a real exotic and adventurous experience. 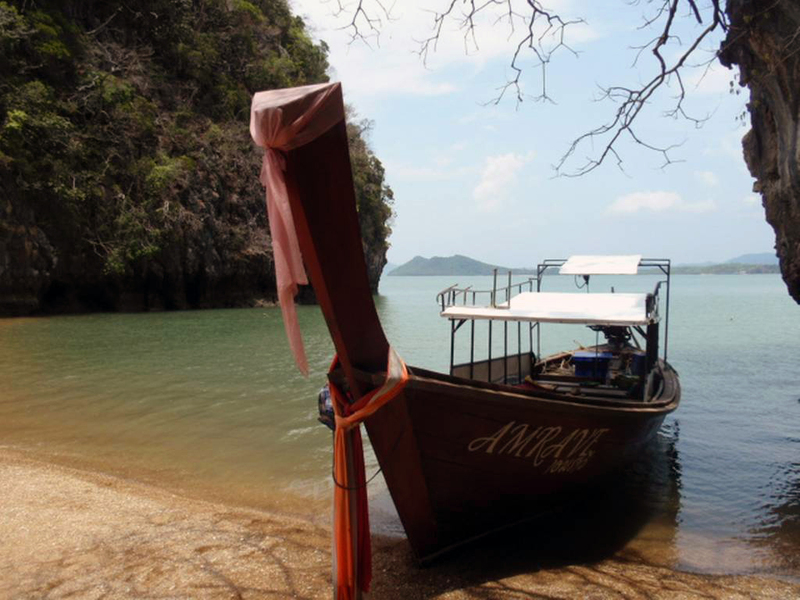 The visit of Koh Phee lasted about 45 minutes, then back on board we moved to the nearby Koh Talabeng Island. 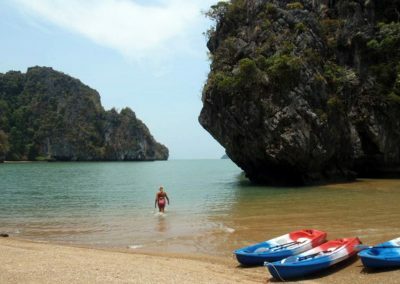 Looking at it from a distance, the silhouette and and type of karsts somehow resemble Phi Phi Leh Island. This is where all the kayaking took place, an important note is that differently from most other sea canoe tours that are offered in Thailand where professional paddlers are provided, here it’s all self paddling so once again a reasonable level of fitness is required. I think all together the paddling lasted a couple of hours or so, kayaking all around the island’s impressive limestone cliffs, and exploring all the little cracks and crevices. 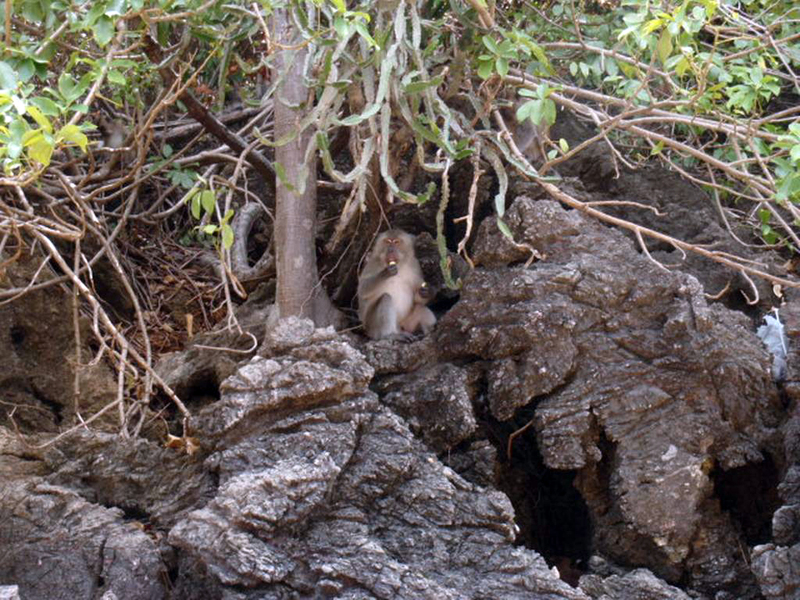 We saw large tropical birds and monkeys at a few of the little hidden beaches. 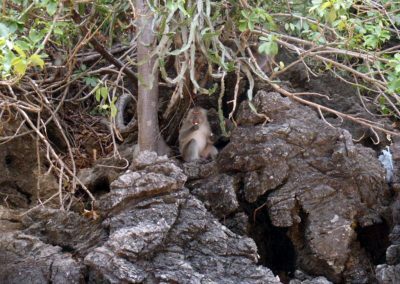 In the middle of all that, we had a long and relaxing break at a small beach, deserted apart from the friendly monkeys. 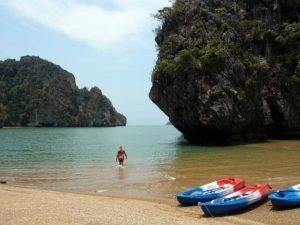 Here we had time for some refreshing swims (though the water is not very clear due to the local geology) and a tasty Thai picnic lunch. Fresh fruits, water/coke and waterproof bags were provided throughout the day, you don’t need to bring any. 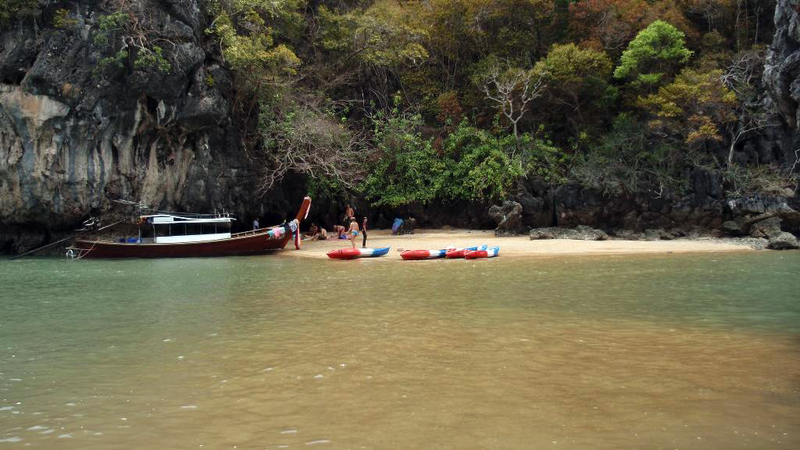 Once done with all the kayaking at Koh Talabeng we headed back to the pier and then transferred to our hotels. 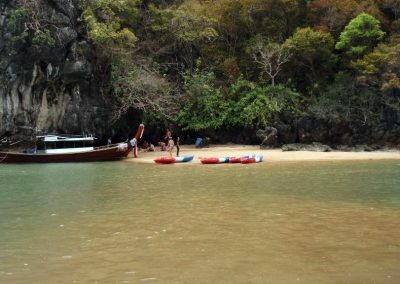 I was back at my hotel around 15:00 hrs, while those in the southern side of Koh Lanta Yai would be back around 16:00 hrs or so. I personally loved this tour, if you like outdoor activities and prefer local small scale tours over mass-tourism then Talabeng kayaking is the perfect solution as they take a maximum of 12 guests per day. The only con, as mentioned above, is that it can be too challenging for some people so really not recommended for small children and people over a certain age or not reasonably fit. Another important note is to bring/wear proper closed shoes/trainers because otherwise the climbing parts could get very difficult and even dangerous. Absolutely avoid going in flip flops. 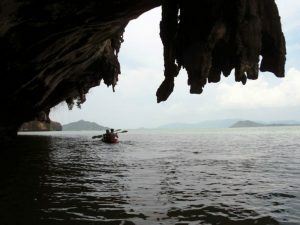 All in all a very interesting experience and highly recommended if you are staying a few days in Koh Lanta. Not suitable for young kids or people with limited mobility. Wear suitable shoes for climbing/hiking.